Do-Ho Suh has a lot going on. 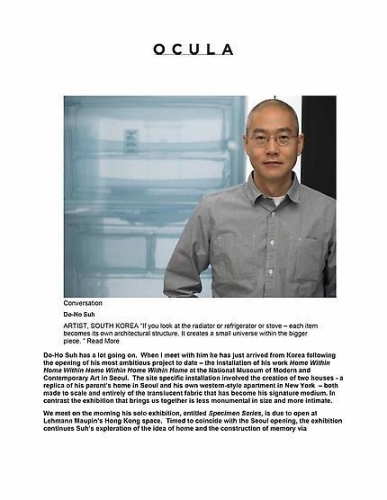 When I meet with him he has just arrived from Korea following the opening of his most ambitious project to date – the installation of his work Home Within Home Within Home Within Home Within Home at the National Museum of Modern and Contemporary Art in Seoul. The site specific installation involved the creation of two houses - a replica of his parent’s home in Seoul and his own western-style apartment in New York – both made to scale and entirely of the translucent fabric that has become his signature medium. In contrast the exhibition that brings us together is less monumental in size and more intimate. We meet on the morning his solo exhibition, entitled Specimen Series, is due to open at Lehmann Maupin’s Hong Kong space. Timed to coincide with the Seoul opening, the exhibition continues Suh’s exploration of the idea of home and the construction of memory via architectural space. For this exhibition, the artist has reproduced, also in actual scale and in fabric, the objects from his former houses and apartments. The gallery space has been carved in two: one side has been painted black and the other side is painted white. In the black section there appears glass encased household apparatus – a red radiator and a blue bathtub, toilet, medicine cabinet, stove and refrigerator. The artist has lit each box thereby drawing out the translucent quality of the fabric, which also results in each object taking on a shimmering jewel like quality. In the other half of the gallery – which is painted white - there appear smaller objects from the apartment – light switches, door chains and other such domestic details – all uniformly presented in white box frames. Under each small item Suh has written the home to which the object relates and its title - Specimen Series: 348 West 22nd Street, APT, New York, NY 10011. USA, Corridor/ First Floor 4 for example. This careful cataloguing of the objects that bared witness to a life lived is reflected in the excruciating attention to detail with which each piece has been completed. There is an acute contrast between the intimacy of the works and their mechanical and meticulous creation. Their presentation evokes not only a vision of Suh’s personal architectural space, but perhaps intentionally and perhaps not, it also evokes the context of a museum. The artist has enveloped the viewer into a space of multiple layers by blurring the boundaries between his personal architectural memory and both the intimate commercial gallery exhibition in Hong Kong and the colossal one taking place in a museum in Korea. Born in Seoul in 1962, Suh moved to the United States shortly after earning his Bachelor of Fine Arts and Master of Fine Arts in Oriental Painting from Seoul National University. In America, the artist continued his studies at the Rhode Island School of Design and Yale University. It was while at Yale that Suh moved from painting to sculpture. In 2001, Suh represented Korea at the Venice Biennale and subsequently participated in the 2010 Venice Architecture Biennale, the 2010 Liverpool Biennial, and the 2012 Gwangju Biennial. Recent solo exhibitions include Home Within Home, Leeum Samsung Museum of Art, Korea (2012); Blueprint, Hiroshima City Museum of Contemporary Art, Japan (2012); In Between, Hiroshima City Museum of Contemporary Art, Japan (2012); Perfect Home, 21st Century Museum of Contemporary Art, Kanazawa, Japan (2012). Hans-Ulrich Obrist, who has interviewed you before, is always fascinated by what he calls the ‘epiphany’ moment in an artist’s career. About three years ago he asked you about your own epiphany moment and I was interested to re-visit your answer here? You know when Hans-Ulrich asked me that question I was caught off-guard. I wasn’t expecting that type of question – because it is such a big question. And I don’t think I had one moment. I think there have been several moments. Certainly moving from painting to sculpture was probably one of the most important moments, but when I look back over the last couple of decades I think some important moments happened even before this. My work and what it has become can be traced back much earlier. It can be traced back to Korea and to the years before I left Korea for the United States. In what way can it be traced back – are you referring to your investigation of space, site specificity or to your use of materials? Well I think my interest in looking at how a work can be transported and the issue of site specificity started in Korea. An interesting thing is that nobody – and I am talking about neither Korean nor American art historians or critics – ever ask me about the work I did before I moved to the US. Can we discuss your very early work now? Yes. The seed for my work was planted when I was in Korea. I had started to make pieces that were transportable. I was thinking already about site specificity and about context and I was questioning modernism – without really knowing it. I was a student of traditional style painting so over that time I didn’t really know what was going on in terms of discourse outside of Korea. My investigation came out of my own necessity, but was aligned with what was going on outside of Korea. The works I was making at the very beginning – I mean before I moved to the US – were questioning the notion of site specificity. At this stage you were painting, so in what ways were you exploring notions of site through the medium of painting? My paintings almost literally walked out of the wall. They were almost like freestanding pieces - almost like sculpture, but with images on the surface. I was observing the form of scroll painting and screen painting in Asian art. When you think of the scroll painting as a ‘painting’, the main difference between the scroll painting verses a canvas painting in the western tradition is that the scroll painting is meant to be transported. You are meant to roll the work and then when you show the painting you unroll it. In comparison, the western painting is meant to be framed and hung on a wall. I think what was significant for me when I look back at this period is this realization that the painting didn’t have to be on the wall. That it could be moved and this was a significant departure. So I had that epiphany moment when I was in Korea. I was also interested in the notion that in addition to being transportable, Asian traditional painting allows for one picture to work as one piece or as several pieces. You can create one big painting by putting the separate pieces together or you can have different paintings. You can fragment the work. I made four large bodies of work that could work as one piece, but equally they could be seen as individual works. These works were freestanding paintings – which I suppose were really sculpture and each facet had images and the images were fragmented. It created a kind of hypertext; and the audience could create their own image from the different fragments. It was impossible to see the entire picture because the work was so big and the painting was not only on one side. You had to walk around the work to experience it. This is very similar in concept to one of your early sculptural pieces, Some/One. In this piece the audience is meant to approach the work from the back so that the interior of the piece, which is mirrored, is not seen until you walk around and discover your own reflection. Yes that is a very good example. The piece comes down the floor and the piece becomes the floor and the audience is encouraged to walk on the floor. That is actually a very important aspect of my work. It was about challenging the notion of the modern sculpture – but I can talk about that later. But in relation to my work in Korea, the idea was that the painting, or the sculpture actually stood out from the wall, and the audience’s movement activated it. The relationship between the piece and the audience is important. The audience in painting is meant to have control insofar as the painting should be contemplated from a distance – but in this work, the audience cannot see the entire work. It was about turning the relationship between the audience and artwork upside down. Were there any other works from these early days in Korea that we can talk about? Yes, I made another work where I blew up hundreds of balloons in my studio just outside of Seoul. It was a piece for a group exhibition in the centre of Seoul. My idea was to transport the breath of the artist - being the air that was captured in the balloon. These balloons were then put into a much large plastic bag, half of which was painted opaque so there is a play between transparency and opacity. I hired a truck to transport the balloons. The work was malleable. I had two rooms in which to show the work and it was a large sack of balloons and the piece started from one gallery and followed the wall and moved into the other room. So I occupied two rooms, and again a viewer couldn’t see the work. So this work was both about fragmenting the work and making it impossible to contemplate as a whole and it was also about transporting space. And that was probably the last work I did before I moved to the States. It is very interesting to hear where some of the ideas evident in your work today began – those relating to the transportation of work, site specificity and the relationship between a work and the audience. However your work also has for many years explored themes around the idea of home and cultural displacement; and presumably these ideas began to manifest after you left Korea for America? Yes, exactly. Once I moved my work started to emphasize the aspect of my displacement. I was also exposed then to new materials, new ideas, and new techniques – this was before New York, when I was studying at Rhode Island. I started to absorb different thoughts and theories. So that was nurturing me in order to move forward. My ideas that I had in Korea were probably immature and the study in the US gave the impetus to what came afterwards. Now you are very much known as a sculpture and installation artist. Can you see a re-visiting of the painting? That is an interesting question because I have been thinking about it. In the last few years I have made a few paintings. You know technically they are almost identical to the drawings that I have made – its just that I did them on a canvas. With a canvas you have a certain amount of freedom to make a mess. Paper is like a one-shot deal right? The painting you can get messy. I was trained as a painter and I was surprised at how quickly it came back. It is interesting you talk of the messiness of painting because when I look at your work I am very aware of how precise, structured and neat they are – like architectural drawings. The reason I went into sculpture was because of the messiness of the painting. The sculpture involves a more structured process; and by nature you have to be more organized. You are dealing with expensive materials and if you, for example, cut the metal incorrectly – well that’s it. In contrast, with a canvas you can scrap off the painting and re-paint. So the approach is so different. I do like being organized. With painting, there are too many variables. But can we expect an expedition of painting from you in the near future? Yes. Well my next show at Lehmann Maupin in New York is a drawing show – drawing on paper. I may have one big painting in the show. The way I am going to make that painting is going to be the same way I do the drawings. Can you explain more about that technique? I made a series of drawing on paper with an airbrush and the medium was ink and lacquer paint. I am going to do that on the canvas – and create a painting. But it will be messier. I was relieved that I am able to experience the possibility of being messy. For the last couple of years I have wanted to do that. It is funny you mentioned this. Yesterday in Seoul I met up with a friend. He is an architect, and he is a professor. He is older than me. He also had a painting exhibition. He showed me his work yesterday and I had this absolute urge to make paintings. So I think that is a good sign. The timing is interesting because just two days ago your installation Home within Home opened to the public at the National Museum of Modern & Contemporary Art in Seoul. And this work is probably the largest and therefore most demanding fabric work you have done to date. Yes by far that is probably the most complex piece I have ever made – certainly in terms of scale and technicality. I feel very confident I have pushed the limitation of fabric and the manner of making the work to its ultimate level. I feel I can now make anything. I think if someone wanted me to make St Paul’s Cathedral in London that with enough time and money, I could do it. So I want to explore something else. That doesn’t mean I won’t make the fabric architecture anymore. But possibly I will be more interested in scale. I am interested in exploring the more intimate process of painting. But hey I only just started this thinking in the last couple of days! So I won’t hold you to it? Tell me about the work Home Within Home that is showing at the MMCA in Seoul? The full title of the work is Home within Home within Home within Home within Home. The title references five homes, but actually there are two homes in the piece. One home is my parent’s home in Korea. It is the smallest one. It is the home I grew up in and when I go to Seoul that is where I stay. And then there is the larger house – the one that encapsulates the smaller home within it – and this larger home is my first American home, which I lived in when I went into the US. Both homes are made of fabric and are on 1:1 scale. The Korean house is suspended in the air and the American house is freestanding and grounded - so you can enter into the house and you can wonder around it. The other homes referenced in the title include the Museum itself and also the site of the Museum. The site of the Museum is a historical site and it used to be a part of the Palace complex. During the Japanese occupation, the Japanese systematically tried to destroy the Korean kingdom, including the Palace. So part of the history of the complex is that after the original structure was destroyed following the Japanese occupation, they built a modern hospital on the site. But then in the 60s the hospital became a military hospital and next to it was the military intelligence headquarters, which symbolised the dictatorship during the 70s and 80s. These buildings were then turned over for the use of the Museum and during the construction of the Museum when they excavated the ground they found a lot of ruins. They had to change the design of the Museum because of that and they also recreated one of the Palace buildings. So there are many different layers. Your work is often preoccupied with the issue of overlapping spaces, and related to this also the question of boundaries. Bearing this in mind, I was interested to talk about the work you have done in relation to the Gwangju Biennale. In collaboration with Suh Architects, your brother’s practice, you have created a work entitled In-Between Hotel. This I understand comprises a ‘roving hotel’, which is mounted on the back of a truck; and it will be parked in gaps between Gwangju homes. This appears to be perhaps the beginning of a new investigation in your practice – the exploration of in-between spaces, of the space within a boundary line. Perhaps we can talk about this work? By inserting the truck into these physical spaces it throws up a few things. Presumably this is where the interesting issues relating to boundaries arise – the neighbors are not legally the hosts and therefore it raises the question of who does control the public spaces we take for granted as private? Right – the tricky thing is that the lots where the Hotel is parked do not belong to the individuals living next door – the city owns this space, but psychologically the neighbors feel it is their land. So to park the Hotel we get the permission of the neighbors – but it actually isn’t an official permission that we are required to get from them. We have to negotiate with them. This type of negotiation is a balancing act because it raises the question of where the boundaries are actually. Once they accept the Hotel to insert itself within the boundary, then the boundary and the gap disappears. But what is really interesting is what happens to the residents after the Hotel moves on – because they have not thought about that space before and whether they actually own it or have control over it. Who can stay in the Hotel? Anybody. You have to go through a normal reservation process. We created a whole system around this. The Hotel, as an architectural space, also raises questions regarding private and shared or public space – because a hotel is a shared space that people psychologically take ownership over and make their own private space for a brief period? Yes, I was interested in the Hotel in this way. A hotel creates an interesting space. I have spent one-third of my life in hotel rooms. It raises a question as to what is a public space and what is a private space? A hotel is a completely public space in a way – think about how many people slept on the same bed. No matter how expensive it is a hotel room is a shared space that becomes a private space. The Folly Project is a public art project, but someone pointed out to me the private nature of the Hotel. It was the woman who was the first person to sleep in the Hotel and I had a chance to talk to her at the opening and she said: “Yes this is a public art piece, but when I enter it, it becomes private.” There are many Folly Projects, but for an individual involved in this particular Hotel project, it will become very personal – if they sleep there they will probably spend eight hours at least with the work. The other projects you will spend a very short time with – the work therefore becomes very personal. I have noticed with the exhibition here at Lehmann Maupin that you have honed in on the details of your larger works – presented in fact, fragments of your installations. I have separated out the various pieces that have appeared in the bigger fabric works, and by separating them out you start to become more aware of the details within the individual elements of the bigger works. If for example, you look at the radiator or refrigerator or stove – each item becomes its own architectural structure. It creates a small universe within the bigger piece. It is interesting that the contextualized elements from the bigger installation pieces become works in themselves. Space and the investigation of how a person or object physically and psychologically manifests itself within space is the subject of much of your work. When conceiving this exhibition, did you reflect on the issue of space having regard particularly to Hong Kong, a city much characterized by a lack of space? Not directly, but obviously when I was conceiving this exhibition I was able to conceive this idea of placing just the appliances into the space because the square footage of the gallery is quite similar to my apartment in New York, so without me building the walls I can create the intimacy of a small New York apartment. The scale works here.